The Church honors Mary with the title Regina Angelorum. The obvious reason for this invocation is that she is in heaven with her Son who is King and thus she is Queen. Although true Blessed John Henry Newman points to another reason, one which is earlier in the chronology of Mary’s life and the mystery of the Incarnation. 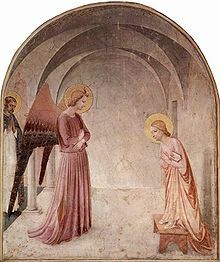 He notes the intervention of two Archangels in the mystery of the Incarnation: that of St. Gabriel at the Annunciation and St. Michael at the birth of Jesus. Christians in modern times forget the presence and work of the angels but with this title the Church reminds them of the existence and powerful intervention of the angels. Holy Mary, Queen of Angels, send your angels to keep us safe and to help us in praising the Most Holy Trinity. The two Archangels who have a special office in the Gospel are St. Michael and St. Gabriel—and they both of them are associated in the history of the Incarnation with Mary: St. Gabriel, when the Holy Ghost came down upon her; and St. Michael, when the Divine Child was born.St. Gabriel hailed her as “Full of grace,” and as “Blessed among women,” and announced to her that the Holy Ghost would come down upon her, and that she would bear a Son who would be the Son of the Highest.Of St. Michael’s ministry to her, on the birth of that Divine Son, we learn in the Apocalypse, written by the Apostle St. John. We know our Lord came to set up the Kingdom of Heaven among men; and hardly was He born when He was assaulted by the powers of the world who wished to destroy Him. Herod sought to take His life, but he was defeated by St. Joseph’s carrying His Mother and Him off into Egypt. But St. John in the Apocalypse tells us that Michael and his angels were the real guardians of Mother and Child, then and on other occasions. First, St. John saw in vision “a great sign in heaven” (meaning by “heaven” the Church, or Kingdom of God), “a woman clothed with the sun, and with the moon under her feet, and on her head a crown of twelve stars”; and when she was about to be delivered of her Child there appeared “a great red dragon,” that is, the evil spirit, ready “to devour her son” when He should be born. The Son was preserved by His own Divine power, but next the evil spirit persecuted her; St. Michael, however, and his angels came to the rescue and prevailed against him.”There was a great battle,” says the sacred writer; “Michael and his Angels fought with the dragon, and the dragon fought and his angels; and that great dragon was east out, the old serpent, who is called the devil.” Now, as then, the Blessed Mother of God has hosts of angels who do her service; and she is their Queen.